The Phizzing Tub...: It's Clean!!! 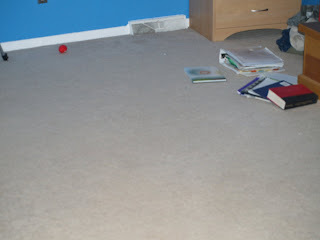 Can you see the carpet? I was stunned this morning when Nate said to me that I just might be surprised. I gave him a blank look and then it hit me. OMG! He cleaned his room up. His room was always spotless as a youngster, everything always had to be picked up, placed in the right spot and he made his bed. Oh! That pile of shorts in the back corner was made by me as I sorted through all of his stuff to be washed. The books however have been there since the last day of school (6/5) and more than likely they will remain there until it starts back up again in a few weeks.